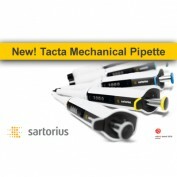 The latest mechnical pipette from Sartorius is now available from Elkay, Sartorius's largest UK pipette service dealer. Tacta is light and wonderfully ergonomic whilst maintaining superb reliability. Elkay are very pleased to be adding the entire range of single and multichannel Tacta and are sure our customers are keen to get these in their hands! Click here to see our Sartorius Tacta range or here to see the Tacta in action. If you would like to arrange a visit with one of our fully-trained Sales Representatives, please call us on +44(0)1256 811118, email us at [email protected] or use our online Enquiry Form.